Recently, my friend Mary got a job offer to become a Math Recovery teacher. She’d be leaving her 1st grade classroom at one school and relocating to another campus. It was a bit overwhelming to think of moving all her stuff to a new place. I asked if she’d like help in packing and moving, since I had actually written a book about this! I told her we could get her room ready in one day. She looked at me like I was a bit crazy, but agreed to let me assist. Two days before Moving Day, I gave Mary a copy of Spaces & Places and asked her to read the chapter on “Packing and Moving.” I also helped her make a list of what was important for her to pack and take along to use in her new job. She made a 2nd list of packing supplies needed for the move, so we wouldn’t waste any time on Moving Day. And I took photos of areas around her room to help her remember how we’d set up spaces that worked well for her. 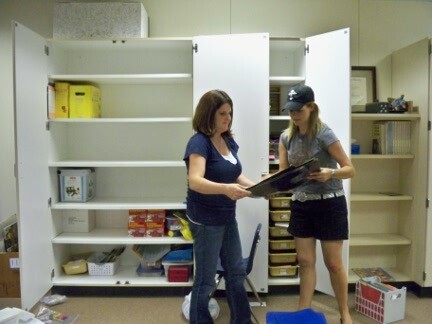 On Moving Day, we’d tape those pics to the outside of the boxes we packed her materials in. Friday was Moving Day. Our friend, Christe (who used to be Mary’s teammate), Sara (Christe’s daughter) and I showed up at 1:30 PM on Mary’s last day at school after the kids had left. 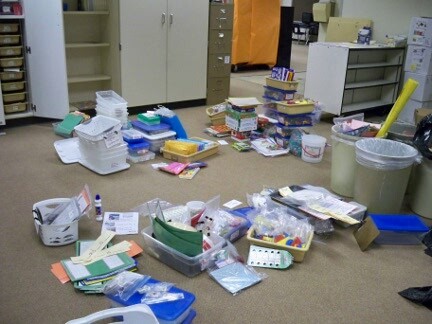 Little did we know that the custodians would be locking the building at 4 PM and we’d have to be out by then. Not to worry—we had a plan! See what we did in just 2 ½ hours. Many hands make light work! All of Mary’s stuff sorted into piles. 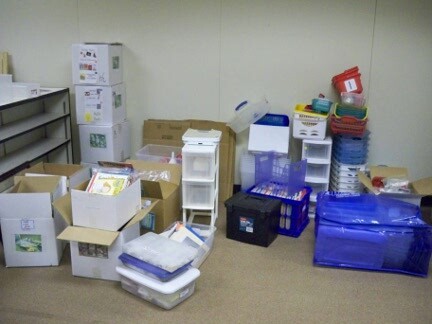 Each has a label: math, language arts, office supplies, Martin Elem., etc. 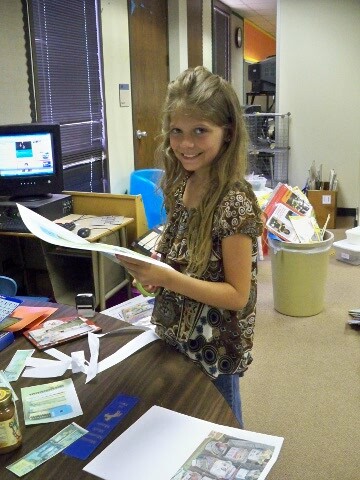 Sara helps us make labels for boxes to be moved. Each will have a photo of the kind of stuff that’s in the box taped to the outside. 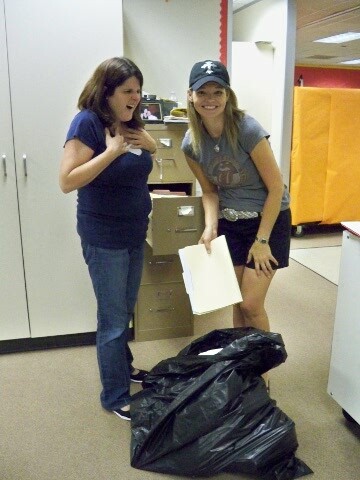 Christe cleans out Mary’s files, and Mary gasps with horror that she has to part with stuff she’ll never use again! 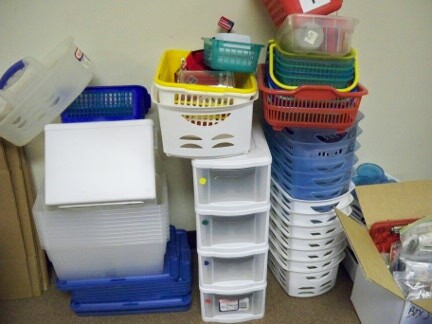 Look at all those containers Mary had! 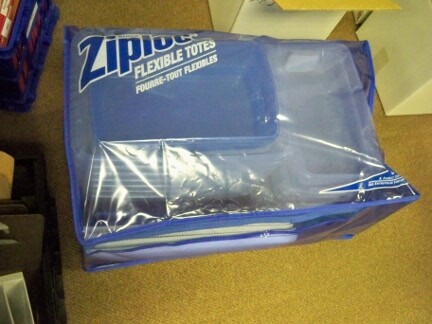 We’ll put the containers in an XXL ziplock bag and move them to her new building. 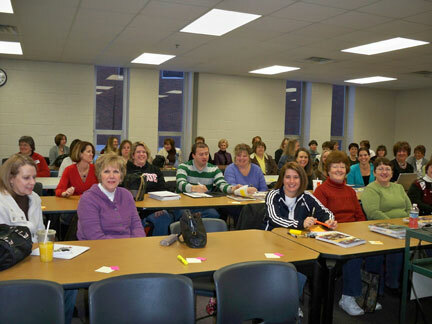 Recently I worked with teachers in Indiana. When I got to the room where we were meeting, I didn’t pay much attention to the space… until teachers came in and began to sit down. 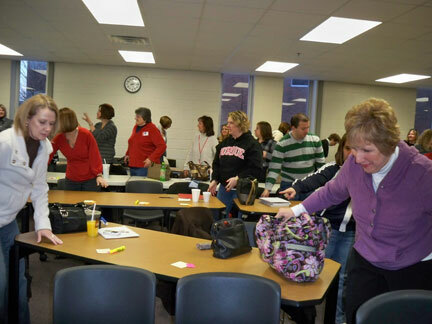 I looked at the room arrangement and thought, “What does this tell teachers about how we’ll be learning today? So, I asked teachers to help me move the tables before we started instruction for the day. I could have done it myself, but many hands make light work! We were done in just a few minutes. 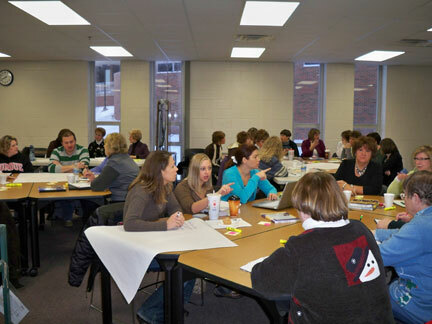 Throughout the day, teachers worked collaboratively in groups. 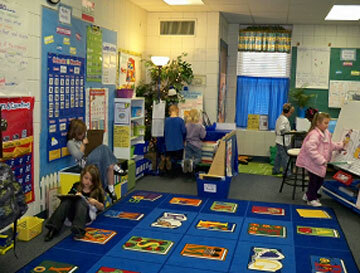 What a difference the arrangement of furniture makes in a classroom! 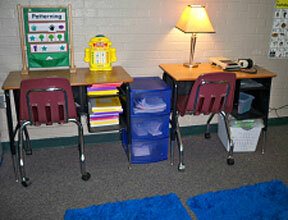 How has your furniture arrangement affected learning in your room? 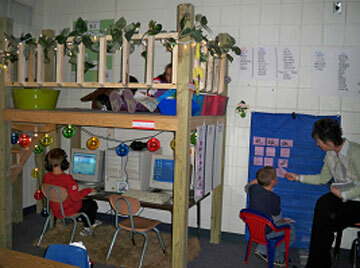 Here are some more amazing classroom spaces from my trip to Cabot, AR. This time they are from Ward Elementary School. Feast your eyes and be inspired to create a place of beauty for your students! 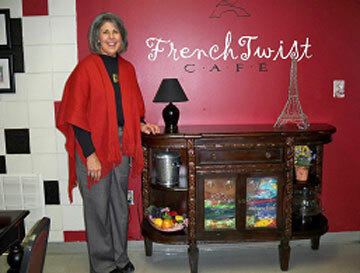 Michelle French’s faculty room at Ward Elementary in Cabot, AR was decorated like a French bistro. Of course, she’ll never be able to retire. The school library is just as lovely as the classroom libraries. 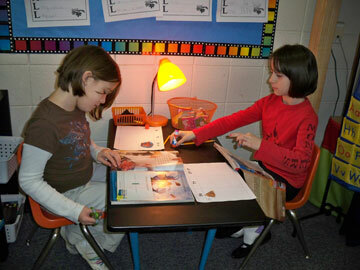 Looking in on partners working at literacy stations. These lucky kids have a loft for reading. Love the lights! Don’t you just want to curl up and listen to a book in this space? 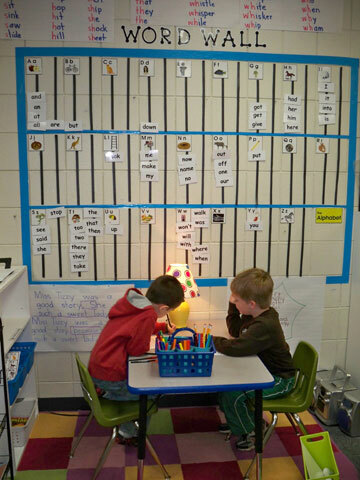 Note the fun lamp lighting up the word wall in this writing station. 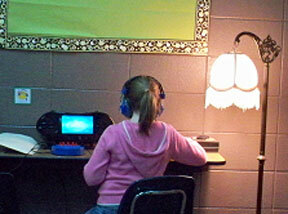 Another lamp in a word study station. Illuminating, isn’t it? 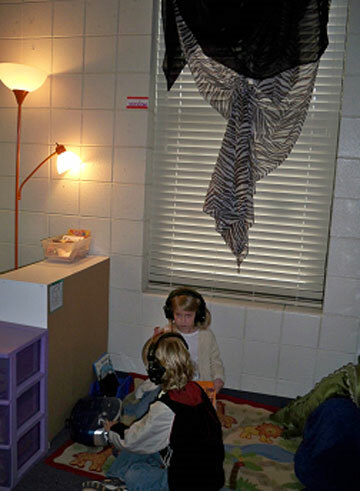 When I visited a couple of schools in Cabot, AR recently, I was amazed at the wonderful classroom environments teachers created. 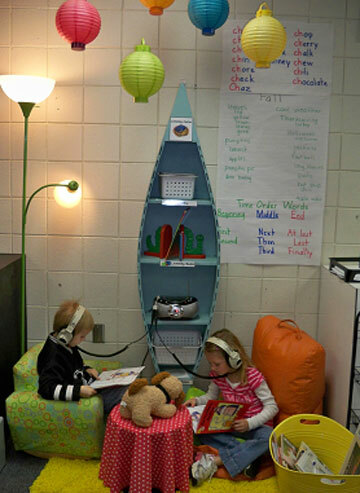 At Northside Elementary, their use of lamps and lighting created calmness and ambience in their rooms. Color choices were thoughtful and deliberate. Upon entering their spaces, I felt at ease and wanted to stay for a while. Imagine how their children respond! 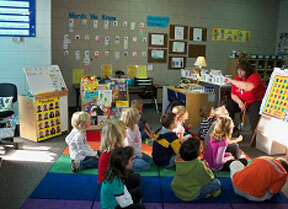 But this wasn’t just limited to classrooms. I saw it in the principals’ offices and even in the faculty lounge. 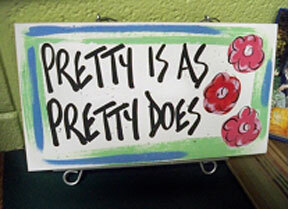 When I visited principal Suzanne Proctor’s office, I was greeted by the sign, “Pretty is as pretty does.” It’s so true! The principal’s daughter listens to a book on tape. Before the shot, she was playing gently with the fringe on the lampshade. 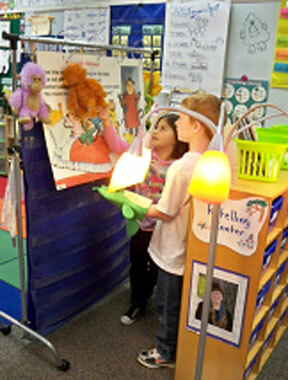 Funky lamp has a playful effect in this fun retelling station. 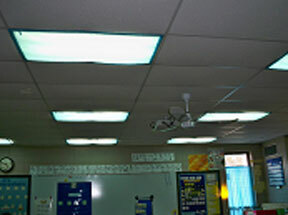 Light covers diffuse light to create a calming effect in classrooms. 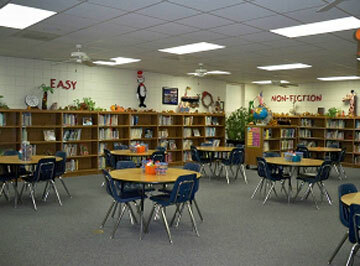 Lamps light up special spaces for students in a resource classroom. Sunlight streams into this beautiful, purposeful room. Sign in the principal’s office says it all!